‘Thorium’ is the debut album from the Belgian heavy metal band of the same name. Thorium was formed two years ago and their line-up includes former members of Ostrogoth. Just in case the connection to the band Ostrogoth was not obvious, this album includes a song called Ostrogoth. It’s an entertaining, albeit a little cheesy, piece of melodic power metal with powerful vocals and good guitar work. I like how they managed to get the guitars to mimic the sound of galloping horses towards the latter half of the track. Watch out, the Ostrogoths are coming!! Some of the songs reminded me of early works of Helloween, mostly due to the pace and the similarities in the vocal style. There are also elements of traditional heavy metal and thrash metal on here. This is evident in tracks such as Godspeed with its catchy chorus as well as more varied but no less cheerful-sounding guitar melodies. They continue with the same mixture of heavy metal and power metal for the rest of the album. The final track Four by Number, Four by Fate is one of those that listeners are either going to love or hate. It definitely stands out on here for numerous reasons. Let’s start with the length – it’s just short of sixteen minutes which is very long even for a ballad. The style is a mish-mash of everything ranging from acoustic guitar instrument parts, progressive guitar riffs, power metal, heavy metal to some thrash metal thrown in just to keep you on your toes. Personally I think this might have worked better if it was broken up into two separate tracks. Overall, Thorium’s debut album has a lot of things going for it. They have created a good balance of catchy and melodic heavy metal with enough variety to keep the listener entertained. I think that fans of power metal and heavy metal will enjoy it, especially those who are into Helloween and Iron Maiden. Tampere’s prime metal festival South Park was back on this year after a brief hiatus in 2017. It’s a two day event but I only attended the Saturday. This year marked the return of the band that I discovered at the same festival three years ago – the one and only German power metal legend Helloween. In summary I had a great time at South Park even if it was just for one day. It was worth it especially for Accept and Helloween. Amorphis and S-Tool were pretty good too. If the line-up is this good next year I will definitely come back again. ‘Blind Faith’ is the latest album from the Swedish heavy metal band Mean Streak. The band was created in 2008 by the bassist Peter Andersson. Right from the start their main objective has always been to “write classic metal straight from the heart”. This album was mixed by Max Norman (Ozzy Osbourne, Megadeth, Armored Saint, Y&T) and mastered by Thomas ”Plec” Johansson (Soilwork, Onslaught, Armageddon). The first thing that came to my mind after hearing the opening track Blood Red Sky is that in addition to classic heavy metal and NWOBHM, these guys have also been influenced by some old school 80s power metal bands like Helloween. Mean Streak’s music is essentially a hybrid of all three of the aforementioned styles. There is also the odd progressive element such as the guitar patterns midway through Settle the Score’. You get your classic heavy metal tracks such as Tear Down the Walls – an uplifting song centered primarily around the sing-along chorus and the guitar riffs. The Helloween influence is evident on tracks like Love is a Killer, which is also one of the fastest and most energetic songs on here. Unlike a lot of power metal songs, this one lacks the ultra cheesy lyrics but has the right pace, the melodic, Helloween-esque vocal style and the catchy guitar tunes. Speaking of guitars, if you’re a fan of twin guitar harmonies, then you will definitely enjoy Fire at Will as well as most of the fast songs on this album. Overall, listening to ‘Blind Faith’ has been a positive experience. What Mean Streak have created here may not be pure, classic heavy metal but it is thoroughly entertaining. It’s a guitar-driven heavy metal album with a modern twist. Returning once again with their 15th studio record, Helloween go back to their roots of making just pure heavy metal music. It also marks the first time the band have released five consecutive studio albums with the same line-up, with Andi Deris on vocals, Michael Weikath & Sascha Gerstner on guitars, Markus Grosskopf on bass guitar and Dani Löble on the drums. Also, with Charlie Bauerfeind producing this, it is sure to be a great record from them, as Charlie has produced some of my favourite Helloween records. Including the highly praised “Gambling with the Devil”. The album opens strong with hard hitting, power metal songs like ‘Heroes’ and the title track ‘My God Given Right’. Almost automatically you feel that punch. The standard power metal type sounds with Andi’s vocals just soaring above the production. The guitars sound great and the bass lines play nicely at the bottom of the tracks. Helloween have such a commanding presence to them and it shows in this album, with powerful choruses that have a sense of presence to them. I have a feeling that the band just wanted to stick to the simple concept of making good old fashioned headbanging tunes and cut out any signs of pretense. So Helloween at their strongest then. In my opinion it’s worked, as I feel this is one of their best albums in a while. In saying that, though, I do have some niggling problems with this album. Whilst the production is strong and the songs are well written, some of the songs on the latter half of the album are a little bland and have no real bite to them. As a result I found myself skipping them upon repeated listens. Also there is a feeling that maybe they’re trying too hard to recapture their sound from the 80’s, with the tone of “it worked back then, it’ll work now”. Nothing wrong in writing in a similar style but it feels like pandering to the “retro” crowd and if there’s anything I hate is music talking down to me. I don’t know, the album comes off as formulaic, like if they stick to a certain pattern of writing it will sell. So it doesn’t feel 100% natural. Yet, I don’t think any of this was intentional, it’s just how it comes across. Despite my problems, which you may not even have, I still enjoy the album. It has a lot of strong hooks and catchy melodies The guitar solos are fun to listen to, and air guitar to. There are certainly the standout moments of the record: ‘Living On The Edge’ feels quite epic and ‘Lost In America’ has that radio friendly feel that I think would go down well with live crowds. ‘If God Loves Rock ‘n’ Roll’ is quite fun too. Also, nothing is getting me more pumped lately than the album’s opener ‘Heroes’. So it is fair to say that this album has definitely caught my ears in the right way. Is this another classic from Helloween? Have the rekindled their spark from the early days? Well… Yes and no. Whilst the album is soaked in nostalgic tones and the songs are fun. I mean if you’re a fan of old school Helloween, then I say yes, go and buy this album, and more than likely you already have. Yet, the average person who’s only familiar with the band in passing, may find that it will rub them the wrong way, with the formulaic sound and pandering tone. So, my final verdict. I like it. It’s fun and it’s good to hear another Helloween album. My problems with it don’t bother me so much that it ruins the listening experience. I would say it’s worth at least a listen. If you like what you hear from the tracks I suggested then I say go buy it. Radio City South Park is a relatively new metal and rock festival held in Tampere. It was created last year after the demise of Sauna Open Air replacing it as the city’s main metal event. This was my first time at the festival and I was only there for the Saturday. Overall South Park may not be the biggest Finnish metal festival, but it’s an interesting one. The good thing is that it featured a few bands whom I haven’t seen live before. I discovered the delights of Ranger and Helloween; Amorphis were pretty much what I expected them to be and I might have to give Viikate another try. Kiitos Radio City South Park! See you next year! 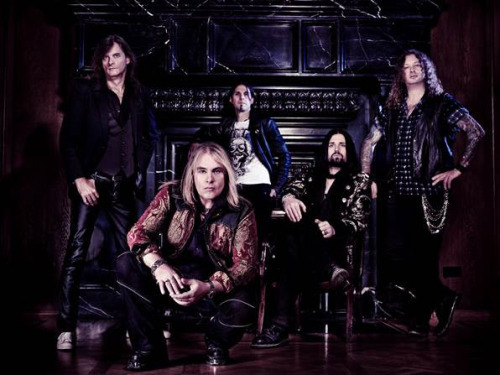 Hailing from Germany, Helloween have been an influential driving force on the power metal scene for 30 years, as well as one of the most internationally successful acts. This year, the Hamburg-based quintet celebrate their 30th anniversary. The band’s latest studio album Straight Out Of Hell, charted at a sensational #4 in Germany, and held their position for five weeks. Additionally they made another five top ten entries in Europe and also cracked the US Billboard Charts. We are more than proud, that Helloween is part of the Nuclear Blast family again. All those years we had a friendship-like connection and ways crossed on a regular basis at concerts and festivals. Helloween to us is a matter of the heart, there’s not only the two records to mention, but an act that influenced me and many of our employees. Together there are big plans and we are looking forward to having another productive and successful cooperation. As a label, Nuclear Blast is “heavy metal to the bone”, and we are really looking forward to working together with a lot of familiar faces. Along with Blind Guardian and Grave Digger, Helloween are one of the longest running and most prolific bands of the German Power Metal scene. Their career is a textbook example of the journey that many metal bands go through. Their first album, Walls of Jericho was a highly acclaimed debut that shortly followed by the band’s masterpieces: The Keeper of the Seven Keys parts 1 and 2. In typical eighties Metal band style, the group entered their second decade of existence with an awkward experimental phase in the early nineties, recording Pink Bubbles Go Ape and Chameleon, to far less success and acclaim than their previous releases. After this, the band bounced back with The Time of the Oath and Better than Raw and have since settled into a more stable pattern of creating a decent album every few years for the last decade or so. This brings us to 2013 and Straight out of Hell. What should listeners expect of this album? It’s a solid effort from a mostly solid band. Worth at least a listen or two, the record features a relatively diverse amount of songs that showcase Helloween’s great style. Fast songs, slower songs, the epic 7 minute opener, anthemic songs and a decent sprinkling of the band’s trademark eccentric humour for good measure make up this record. Some album highlights include Far From The Stars, Church Breaks Down, the title track Straight out of Hell, the gloriously cheesy Hold Me in Your Arms and the epic starter track Nabatea. This is a reliably good record that should sit comfortably in the collection of any Helloween fan, but also any fan of modern Power Metal. 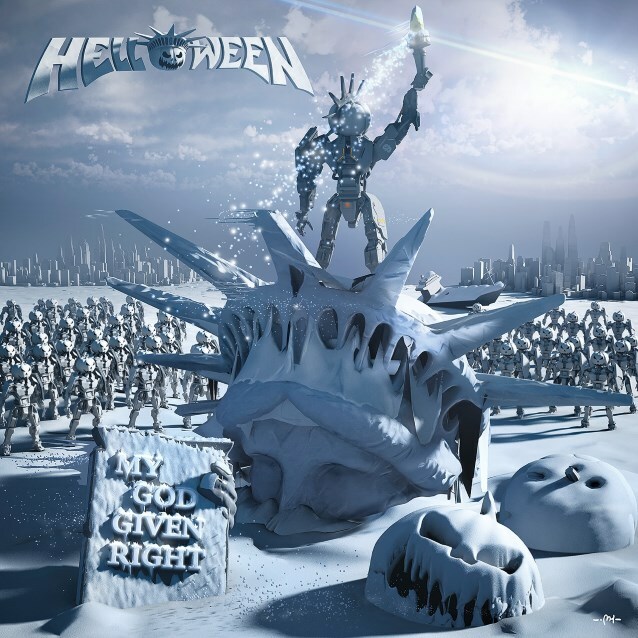 With typical Maideneque song writing that has so often defined the band, soaring choruses and epic, neoclassical elements, this album is proof that Helloween can still write some entertaining songs.